Had a fantastic time in Canada with a show of The Home Front curated by artist/academic Katy McCormick across two gallery spaces: Ryerson Artspace and Gallery 310 (University of Ryerson) in Toronto. 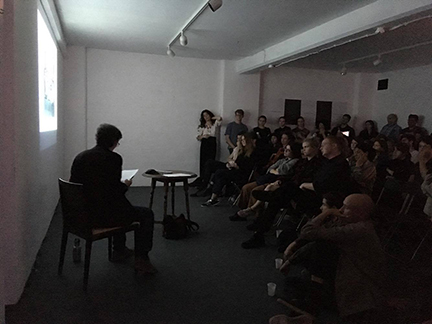 Brilliant questions from the audience after my talk, and it was great to re-connect with Katy, artists, academics & photo students in Toronto. The exhibition prints travelled from the previous edited show of The Home Front at University of the Arts Philadelphia, thanks to curator/artist/academic Anne Massoni. The original exhibition of The Home Front was shown at Impressions Gallery, UK in autumn 2013 (curator: Pippa Oldfield). On 22 October I really enjoyed my time in Edinburgh: guest lecture at Napier, hanging out with Sophie Gerrard, and meeting photo students. I spent the next month finishing the preparations for the move of my photojournalistic archive (early 1980s to late 1990s) to The Bishopsgate Institute. This felt momentous, and fantastic to have found such a great home for this work. It was a very emotional time going through all the negatives and prints, and recalling the many encounters and experiences I had, both here in the UK and abroad. Now back to work on The Plain, and to teaching at Sussex. The front page image on this website is from my new work The Plain: A Militarised English Landscape, (previous working title: The Lacquer Box & The Field Gun). I first started work on this in late 2015, and will complete the work summer 2019. The work focuses on the militarised landscape of Salisbury Plain in Wiltshire, England. More images soon! During the first half of each year I teach on the MA module in Photography at University of Sussex, and also supervise four PhD students, so it’s all pretty busy – and very interesting. Occasionally I’ve had time to do a bit of work on my new project (working title: The Lacquer Box and The Field Gun) about Salisbury Plain (landscape photography, and sound) and I will get back to that properly this summer. On 22 May I presented work in progress on The Lacquer Box at the Spaces of War, War of Spaces conference in Florence, organised by the Media, War & Conflict journal. This was a brilliant conference and I had an amazing, if very brief, time in Florence. I am also planning my September trip to Toronto, where I will be showing The Home Front and also work in progress on The Lacquer Box and The Field Gun (full details coming soon). 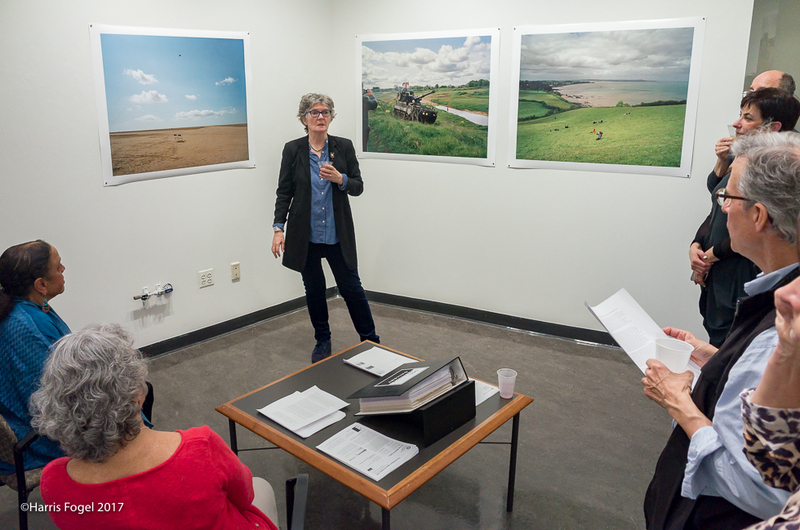 I had a fantastic trip to the States in early November: The Home Front, in an edited version, was showing at the Sol Mednick Gallery, University of the Arts, Philadelphia. I went over for the opening, to give a guest lecture & gallery talk and had very interesting meetings with several of the students. It was brilliant seeing Anne Massoni again, the Photography programme director/artist, and curator of this show, & I enjoyed meeting all her colleagues. Many thanks to Anne for all her hard work printing the work in Philadelphia and also to Harris Fogel, director of the gallery, for all the organisation & publicity. Thanks to Harris for the photographs below – all of these are his copyright. 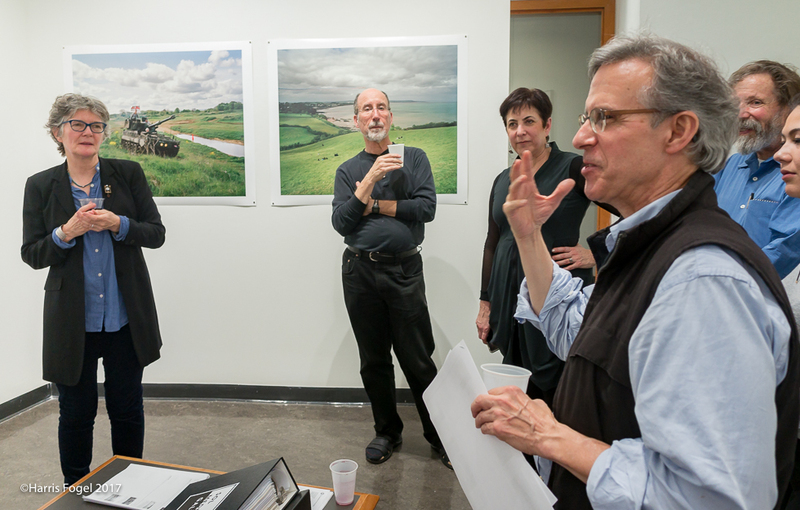 Many of the people featured in the gallery shots are prize-winning photographers who had been selected for the close-by Gallery 1401 exhibition “The Photo Review: Best of Show”. [The Photo Review, founded in 1976, is a independent journal of photography]. 14 August 2017 On 10 August at Platform Southwark, London SE1, I was very honoured to be the guest speaker at the launch of The System of Systems publication created by Maria McClintock (see systemofsystems.eu), talking about my 2007 work Border Country, which focused on asylum seekers and migrants in detention (immigration detainees). The System of Systems publication, created by Maria McClintock, includes my essay on Border Country, many wonderful visual and written essays by artists, activists and academics on the asylum process. It is available in the ICA Bookshop, Housmans and others. 10 August launch, courtesy systemofsystems.eu and @PlatformSthwrk twitter feed. Now working on the details for The Home Front solo show at Sol Mednick Gallery, UoA Philadelphia, USA, 31 October – 5 December 2017. Very happy that two images from The Home Front exhibition are to be included in Impressions Gallery exhibition at The Bradford Club 18 August – 30 September 2017, as part of Impressions’ celebrations 10 years in Bradford: 45 years in Yorkshire. Going up for the opening on 18 August. I presented my sound/image piece The Lacquer Box & The Field Gun: A study of the militarised landscape of Salisbury Plain as early work-in-progress at the Poetics & Politics symposium on 3-4 June. This was great – met lots of film academics, many from the States, and really enjoyed other practitioners’ presentations. Photographs below, courtesy of Matt Gibson, of the panel I was on, Military Quotidian. (Both photos copyright Matt Gibson). L to R: Sharon Daniels, Melanie Friend, Margareta Kern, Lizzie Thynne (chair). Interviewed an ex soldier on Salisbury Plain at Imber, the village evacuated by the army in World War II and now used as a training area. Preparing a presentation on my work in progress on The Lacquer Box & The Field Gun for the Poetics & Politics conference 3-4 June. Very busy time at Sussex. Will be returning to Lacquer Box project fully this summer. Meanwhile great news that The Home Front, originally Impressions solo exhibition (curated by Pippa Oldfield) is travelling to the Sol Mednick Gallery at University of the Arts Philadelphia this autumn 31 October – 5 December, thanks to Anne Leighton Massoni. (Also negotiating with two other north American venues – details to come!). Six Border Country images (plus soundtracks) were included in The System of Systems exhibition at Grace gallery, Athens, 4-21 May, 2017. Very busy & enjoyable time back at Sussex with two full groups of MA students taking Photography as an option. Gave the Keynote presentation – on my 2007 work Border Country – at the Picturing Migration symposium at National Library of Ireland in Dublin, organised by IADT (Dun Laoghaire Institute of Art, Design, & Technology) & artist David Monahan. Hugely enjoyed being back in Dublin and meeting photographer colleagues, such as Mark Curran, again & Ann Curran from DIT. Standing By finally went out in public on 8 March as part of the Relatives Film Festival at University of the Arts London (London College of Communication). It was a small/medium size screening room but packed, and it felt like a very good venue for it. Good acoustics. This felt quite momentous – and really positive. Part of a panel with filmmakers Victoria Mapplebeck & Zadoc Nava. I will now submit to a small number of film festivals. But I would like it to be part of a gallery group show themed around family/relationships/ageing/memory/Alzheimers. It needs to be viewed in an intimate space – not a large cinema or large lecture theatre. I have been fine-editing Standing By, my sound/still image 25 minute film about my parents (which has many other resonances, I feel…). It is such a personal piece, I have mulled over the final edits for a very long period of time (& finally cracked it). I was invited by Ben Edwards, course leader of the MA Documentary Photography and Photojournalism at University of Westminster, to give a Guest Lecture on 23 November. Great to meet the students there, as ever; I always enjoy coming back to Westminster (where I studied for my own BA back in the late 1980s…). As I’m a mentor for FOTODOCUMENT, I made my first contact with the photographer Ana Caroline de Lima, who won one of the FOTODOCUMENT commissions. Looking forward to seeing the results of her work! 8-10 June returned to Dublin to see the excellent DIT BA Photography Degree show held at Gallery of Photography, Dublin, and review the work as external examiner. Again, a wonderful visit to DIT & Dublin. 27 May Much enjoyed meeting Ziortza Fernandez Ibbareche at University of Westminster, and being one of the judges for the Migrants: What does Migration mean to you? exhibition, which was then shown at Gallery on the Corner, Battersea. Spent a good deal of time on Salisbury Plain, getting immersed in my new project – interviewing, stills, ambient audio, transcribing. 4 May I was on the judging panel for FOTODOCUMENT, in London, to select photographers for the commissions ‘Empowering Women Entrepreneurs Worldwide’. A wonderful day, and a really great project. After my initial research trip last August, I returned to Salisbury Plain during wild & windy weather. I’ve started to get to know the landscape & am setting up interviews with local people. On 15 February, I was invited by Rupert Cox at the University of Manchester to give a Guest Lecture on my photography (& use of sound) to MA students in the Anthropology Dept. Had a brilliant time and enjoyed reconnecting with Rupert, an anthropologist/sound artist interested in sensory ethnography (see his fascinating work Air Pressure, made with Angus Carlyle). 18 February I gave a talk about my photography at the City Literary Institute (City Lit) in London, invited by Shirley Read. Much enjoyed re-connecting with Shirley & meeting the photography students there. I’m going to give a talk about my work at University of Gloucestershire on Monday, 7 December. Looking forward to seeing artist/lecturer Anthony Lam again, and to meeting the students there. It’ll be good to be back – I was last there 7 years ago! I also have several guest lectures coming up in 2016. Over the past few months I have been making the final tweaks to my piece Standing By. This personal sound/image piece focuses on the 60-year relationship between my parents (both born in the 1920s), focusing on their use of the crossword. It’s intimate, and, I hope, humorous. It also looks at traditional gender roles, class, old age and, fleetingly, Alzheimers. It’s a 26 min piece, using soundtracks recorded between 2000 and 2007. It includes 67 still images. The photographs were taken over an 11 year period, (2000-11), mostly as family snaps, and they come from a range of sources: Lumix (digital), i-phone 3, Leica (35mm film) and medium format film (Mamiya 7). I have also included 1950s images from my parents’ wedding and honeymoon album. As usual it’s been a really busy summer at the university. In June I was also part of the panel judging the FotoDocument One Planet Living photographic competition. On 15 May I had a fun trip up to Liverpool where 12 images from The Home Front were included in the opening night programme for LOOK/15: Exchange, the biennial Liverpool International Photography Festival, at Tate Liverpool, organised by Anna Fox. I’ve started researching a new long-term project, UK based, which is exciting. I’ll be carrying out the bulk of the photography and interviews for it during 2016/17. More soon! Intriguing papers & fun time that evening, hope to return. Great to be able to get there by train too.